Kirsten Shaw and Michael Hunt are trading in their 2,200-square-foot home for a makeshift 300-square-foot dwelling that rests on wheels. And the Canadian couple plan to take their home on the road, driving with their son through the U.S. for a year. "Honestly I am not a homemaker," Shaw told the CBC. "It stresses me out that I have all that dusting and everything to look after." 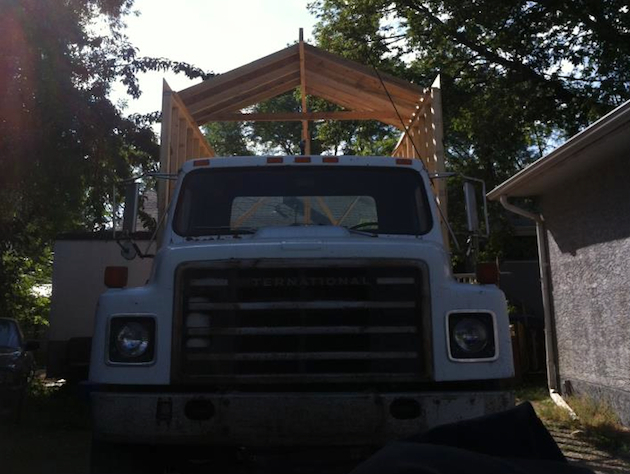 Their new traveling home (not to be confused with a mobile home) is made of wood and is being built on the top of a flatbed truck. And the living space itself will be connected to a utility trailer that houses a kitchen and sleeping area. "There's going to be a sleeping loft above the cab and then two sleeping bunks, which will also have the seat belts in it, and it's going to have a bathroom and then the TV and video games and all that stuff for the kids," Shaw said. The couple are documenting construction of their new dwelling on their Facebook page, Tiny House Calgary. On one of the page's photos, Shaw notes that her son, Chase, may end up being too large for the compact quarters. "The cab is only 6'. There will be a bit of an overhang but not much. He might have to sleep on a diagonal," she wrote. "The online height calculator we did a few years back put him at 6'2" to 6'4"!!!" Shaw has three children from a previous marriage who will also be along for part of the ride. "My three kids will come on vacations and weekends and stuff like that," she said. After their tour of the U.S. is complete, Hunt and Shaw said they plan to settle down in a more conventional home on Vancouver Island.